After returning home from my trip to Lisbon, I sat behind my desk, staring at the computer screen, reflecting on my trip to Portugal’s capital. My mind and hands were willing, but punching in keys to produce the words that would form this article became an exhausting task. Whatever energy I had gained from my 4 day trip depleted with every thought about it. In truth, I had no idea what to write. Even now, as I finally am capable of typing, I’m still not sure what to tell you. Thoughts, words, and sentences are all formed in my mind, but only to describe my state of being, and not Lisbon. If I’m going to write this article, I need a drink, many drinks, actually, for the refreshing taste of alcohol reminds me of… Lisbon. I’m quite afraid the thread running through this article will be booze. You see, my Portuguese trip was different than usual. For once, I wasn’t traveling by myself. I have traveled with others, of course, but usually we all have our own plans, and go about our own way. Not on this trip, however. On this trip I was pretty stuck 24/7 to my travel buddy. We were acountabillibuddies, if you will. The thing about my travel partner? He, like me, even more than me, is a drinking man. And let me tell you, there are plenty of places to get a drink in Lisbon. We arrived later than planned in Lisbon, thanks to a very typical, but very unfortunate delay, courtesy of Vueling Airlines (Never fly Vueling, but more on that later). It did mean however, that upon our arrival at the hotel, it was the perfect time to get a drink. We dumped our bags and headed out, straight to the hotel lounge bar, because we were offered free drinks. Once we consumed our free drinks (And several definitely not free drinks) it was time to head out. First destination? Why, a bar, of course! Lisbon has some wonderful streets to walk through, though I wouldn’t recommend driving. Built on top of several hills, the city has a nice variety in scenery and walking pace. Lisbon has a decent and cheap transportation system in place, though I dare not say it’s easy to travel in the city when you’re in a wheelchair, for instance. Our first two days we mostly spent wondering through the city, doing some sightseeing, and of course, exploring bars. We also wasted quite some time finding a decent restaurant. Now, there are plenty of restaurants, though finding a truly good one was kind of tricky. Not because most places to eat were bad, but because my travel partner is a vegetarian. Most restaurants in Portugal serve fish and meat. Finding a place that serves both good vegetarian meals and bloody meals is not that easy. 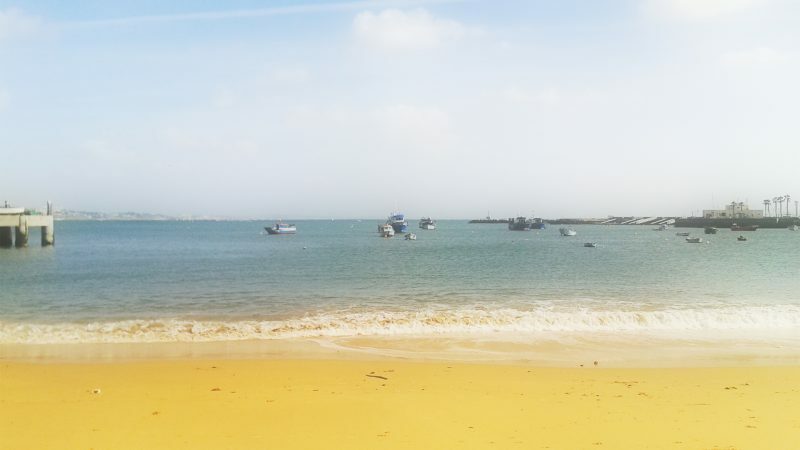 On our third and last full day, we swapped Lisbon for Cascais. It was here we had most fun. Cascais is a small coastal town, a mere 45 minute train ride away. It was a sunny day, a perfect day to spend time on the small, and plentiful beaches of this town. Once again: lots of bars and restaurants. The atmosphere in Cascais is more relaxed, and prices slightly lower. There isn’t a whole lot to see, but if you take your time, and just relax, you can easily spend a day here. We also wanted to visit Sintra, but sadly we lacked the time. It would have made for a decent travel trifecta, but alas. It was in Cascais I also betrayed my principles and ended up visiting a vegan restaurant. Shocking, I know. Vegetarians are one thing, but vegans? A good meal is something that once lived, but had to be killed, but I have to admit I enjoyed the food. On our last day we had about half a day. It was spent on some more sightseeing, and yes, drinking. Than it was time to head home. But not before Vueling airlines nearly gave me a heart attack, and had me rushing through the airport like a doped up maniac. Due to some serious miscommunication, there was uncertainty on how much delay my flight had. From a two hour delay, to a one hour delay, to no delay, back to two hours, etc, etc. After a painstakingly slow phone call, it turned out there was indeed a two and a half hour delay, and my one man impersonation of the Darude – Sand Storm clip had been for naught. I’ve traveled multiple times with Vueling, and each time there was a two hour delay, minimum. I should have known. So what can I truly tell you about Lisbon now I’ve had some time to think about it? Honestly, I still don’t know. Perhaps I shouldn’t tell you anything. Perhaps you should have no real knowledge about it before you go. Perhaps you should simply pay it a visit. Food is relatively cheap in Lisbon. Drinks however, are relatively expensive. Lisbon has a decent public transportation system. You can buy day cards for unlimited access to it, or buy a Lisboa card. Though the Lisboa card is more expensive, it offers discounts to attractions and remains useable for multiple days, saving you the hassle of buying new day cards. Best time to go? February, if you’re willing to take a chance with the weather and temperature. Otherwise: late September, when the climate’s nice and the high season for tourism dwindles down. The Metro. It’s famous, but really? In any other place they would be considered out dated, old, noisy, cramped, and over crowded. For Lisbon however, we decided it’s “charming.” Still worth a quick ride, I guess? Sao Jorge castle is highly recommended on a lot of sites. I disagree; it’s not that spectacular (though the view from there is great). if you’ve seen a few castles, you’ve seen this one.